As always, I tried to make as many gifts myself as I could this year. I didn’t manage to make an all handmade Christmas, but I think I did relatively well, considering a rather surprising lack of free time this year. There were no large gifts, like last year’s behemoth that was Robert’s quilt. Instead, I focused on a couple of smaller items, which I think helped in terms of finishing more items before Christmas. This year’s holiday party at work included an ornament exchange. We were given a budget of $10, and had to bring it in wrapped. I went the handmade route, as did three other people in the foundation. I sorted through some of my quilt/craft magazines for some ideas, and wound up making two little embroidered and beaded felt stars. Patti picked them in the exchange and said she was happy no one decided to steal from her when they had the chance. I forgot to take a picture of them when I made them (BOO!) but I’m hoping to get a picture from Patti, once her camera phone is back and working (she dropped her phone down the toilet, and doesn’t have a regular camera). Since I learned to crochet this season – beyond the single and double crochet in a straight line that I already knew how to do – most of the handmade items took that bend. I made fingerless gloves for everyone who usually goes caroling with us. Even Robert got a pair. He wears them over his leather driving gloves and swears that they make his hands a lot warmer. Casey and Anjela each got some gloves (Casey also got some boot socks), and I whipped up a soft cream scarf for Rose. Mission accomplished! Heather told me about a special on Ravelry earlier this year, where one of the pattern designers was giving away a free pattern of your choice for one day only. 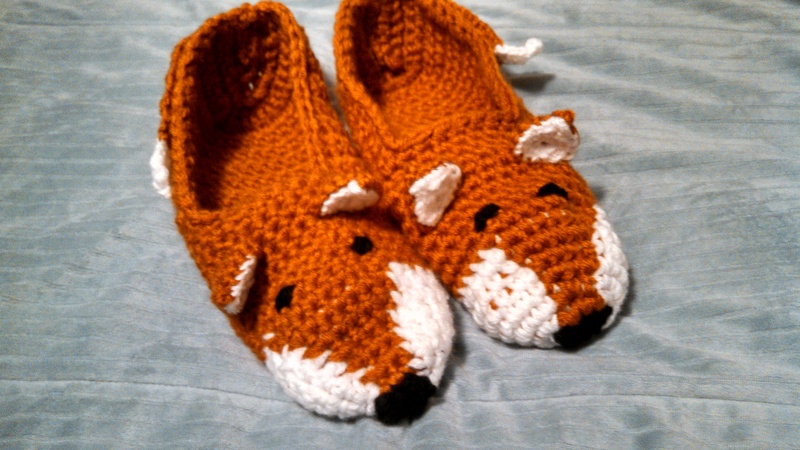 I scooped up a pattern for some adorable fox slippers, thinking Mom might be able to make them for Robert. After mastering the puff-stitch fingerless gloves, though, and taking a look at the pattern instructions, I felt confident that I could make them myself. I’ll admit I had to tear things out every now and then and start over. However, I didn’t end up tearing out as much as I thought I was going to have to. I also learned a few new crochet stitches, learning through a combination of asking my mom (half double crochet), youtube tutorials (picot stitch), and reading written descriptions of the stitch carefully (fake single crochet decrease). I ended up making a second pair of slippers, following the same directions but changing up the colors, to make a pair of wolf slippers for my nephew. Success! **Note** Despite making what should have been the right size (Woman’s 11 is the same as a Man’s 9), both Joey and Robert reported that the slippers were ever so slightly too big. If worn with a thick pair of socks, they tend to fit better, but I’m going to have to bring Robert’s pair in just a bit. Dad and Andrew also proved a little difficult, in terms of coming up with things to make for them. Everyone in my family always ends up with a book anyway (the unwritten guarantee in my house is that everyone gets a pair of socks and at least three books), but I wanted to make sure as many people as possible got something homemade. I remembered Andrew complaining about the billowy-ness of a number of his shirts, prior to a wedding he was going to attend, and I knew that Dad was in need of a few new shirts, so I hopped myself on down to the fabric store and picked up a couple of patterns. I also had to get some fabric, too, as I don’t actually have any shirting in my stash. ::Gasp! :: Unthinkable, I know. I also picked up some bits of corduroy and wool suiting to make a few vests, as I know Andrew likes to go all out when he dresses up for an event. The problem with making clothing for people, of course, is that one needs two things in addition to the materials: time and correct measurements. Since it’s pretty obvious what I’m planning to do when I ask to take someone’s measurements, I held off on the actual construction of the shirts and vests until after the actual holiday. This also allows me to get a little input from folks on issues such as style, fit and notions. 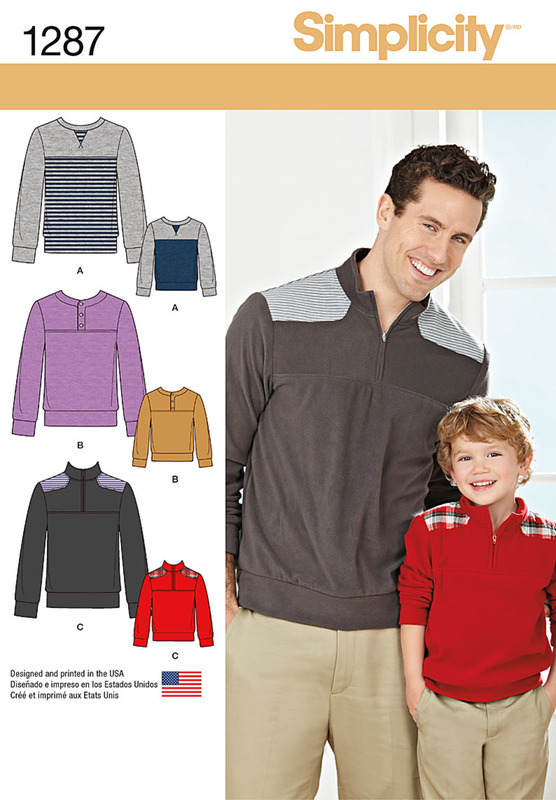 The first finished item was a fleece pullover for Andrew. He chose option B, in gray. I don’t sew with knits often. At all. Mostly because I have just never had the time to really sit down and learn all the little tips and tricks and techniques for getting a professional looking item out of home-sewn knit patterns. However, all of the styles Andrew wanted are knit-based, so I was forced to jump in. I was pleasantly surprised by how easy the pattern was, and how nice the finished product looked. Of course, you’ll have to take my word for it at the moment, as it’s next to impossible to pin Andrew down for a picture of the thing on him. However, Robert recently mentioned that he was looking for something similar to version C (without the shoulder patches). Perhaps a picture is in the future! Dad’s dress shirts are still in the works…the cats enjoy sitting on the fabric and seem determined to find and lay on it, regardless of where I hide it, so I’ve been spending a good portion of time using the sticky roller, to keep the cat hair to a minimum and out of my machine. I’ve got to swing by the store tonight to pick up a new pack of machine needles and some more white thread (I swear I don’t know how I can go through it so fast, and still never feel like I’m making things at the speed I want to! ), and I hope to have that finished tonight. I plan to use a portion of my vintage buttons for the closures.